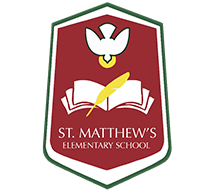 St. Matthew’s Elementary School serves to promote the growth and development of the spiritual, intellectual, physical, emotional and social attributes of each individual. This growth and development is in turn closely linked with the thought that all students will eventually become responsible members of the Christian community, sharing the knowledge and love of God. As outlined in the Policy and Reference Manual of the Catholic Independent Schools of the Vancouver Archdiocese, the formal task of a school is defined as one being not only an institution for education, but as well a place to outline the ethical dimensions for the precise purpose of arousing the individual’s inner spiritual dynamism, and aiding in the achievement of moral freedom which alone can give meaning to the value of human life. It is then our task to provide a synthesis of culture and faith, and a synthesis of faith and life. We recognize this integration as a lifelong process of conversion, and St. Matthew’s Elementary School must remain an active force during the systematic formation of our students’ developmental stages. For all inquiries related to your child or children’s enrollment, contact us by following the link below.